We’d love your help. Let us know what’s wrong with this preview of Granny Get Your Glue Gun by Maureen Goulet. If you are a grandparent or know of one, this is the book for you. Not sure what to do with those Little Bundles of Joy, your grandchildren, when they come to visit for a few hours, or days? 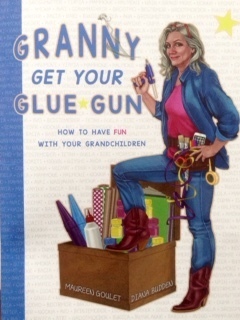 Granny Get Your Glue Gun offers a collection of simple, fun activities including Crafts, Baking, Dress-up, Games and Relaxation ideas for grandpa If you are a grandparent or know of one, this is the book for you. Granny Get Your Glue Gun offers a collection of simple, fun activities including Crafts, Baking, Dress-up, Games and Relaxation ideas for grandparents to share with their visiting grandchildren. Our aim in offering this book is to involve you interacting with your grandchildren. It is your enthusiasm and positive attitudes during the short times you spend together that will contribute to long-lasting and invaluable relationships with each other. To ask other readers questions about Granny Get Your Glue Gun, please sign up. OK, so I know it's written for grandparents, and I'm not one nor am likely to be for years. But I do have nieces and nephews and great-nieces and nephews of various ages, and more importantly I have a son who is entering babysit Disclosure: I got this in a Goodreads Giveaway, but no one paid me to review it. I entered the drawing because I wanted it! So I was really excited to win and get it. My review is independent and no one is happier than I am that it is fantastic! Granny Get Your Glue Gun is my go to present for all the grandparents and young parents I know. Every one of them has loved it and told tales of their creative adventures. The book is filled with fun, stimulating, and well thought out activities and projects. The instructions, illustrations and graphics make it easy to follow.